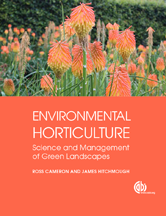 This book reflects contemporary thinking and is supported by scientific evidence to show the role, value and application of horticulture in the landscape. The discipline of environmental horticulture, its importance and impact on the wider environment is explored in the first part, whilst the second part covers practical horticultural management of different categories of environmental horticulture. What genotypes should be planted? Health benefits – not proven? 3.8 What Sort of Green Landscapes Should be Promoted? 4.4 What Sort of Species Inhabit Urban Areas? How ‘green’ are green roofs?